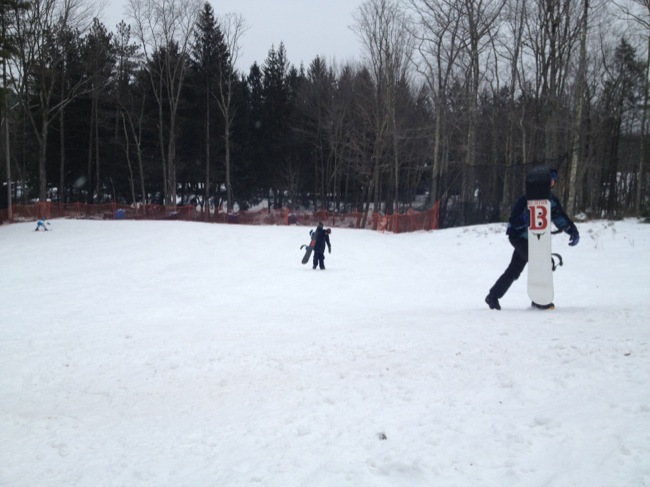 Snowboarding is one of many things to do in the Poconos in the winter. 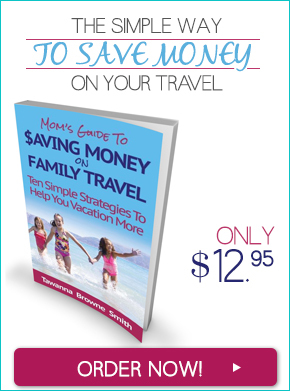 Although Spring is officially three weeks away, the weather is still in the 20’s and 30’s in the Pocono Mountains, and there’s still time to enjoy some quality winter travel with the family. With a beautiful mountain region like the Poconos, you won’t be short on fun winter family activities. If you’re a fan of skiing, snowboarding or snowtubing, that’s easy – there are seven major ski areas to choose from. A month ago, the fam and I traveled up to the Pocono Mountains for a quick weekend getaway. We’ve gradually been creating a tradition, checking out mountain resorts that we can drive to for a few days of winter family fun. Although this is our fourth year traveling to the mountains with the kids, we’re still testing out snow activities with autism. Each year, it’s an adventure. Growing up in New York, what I’ve known of the Pocono Mountains is very different from its image today. 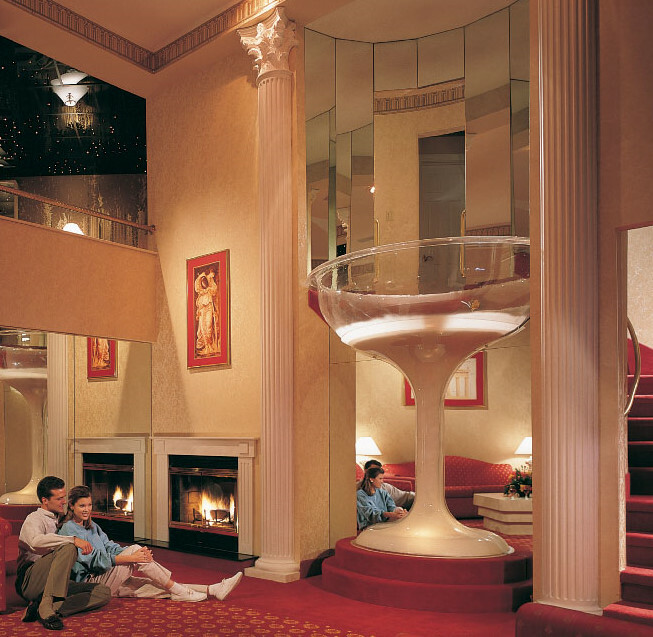 As a little girl, I remember the commercials of the heart-shaped beds, the humongous wine glass bathtubs, and the soothing music with the message that the Poconos was for lovers. It kinda had this cheezy image but if you had a significant other and you were old enough, it was the place to go for a romantic getaway. And everyone referred to it as, the Poconos. Today, a lot of that has changed. The area was always family-friendly but the problem is that many of us didn’t know it because we only knew what was marketed on T.V. In fact, one of the four counties that makes up the 2400 square mile Pocono Mountains region, was seen as a popular vacation destination dating back to 1820. The Pocono Mountains Visitors Bureau has been working hard to revamp the old image of the area. The area is still romantic, but it’s so much more than a honeymooners paradise. 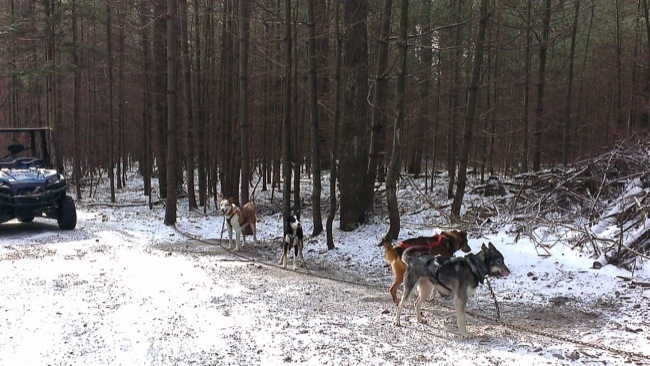 Part of the dog sledding team rearing to go (Skytop Lodge). At select places, like Skytop Lodge, you can also go zip lining. All of the ski areas have family-friendly facilities and rails for beginners and experts. The trails in the Pocono Mountains are 35% Beginner/Novice, 32% Intermediate, and 33% Expert. And even when there’s no natural snow events to add to the trails, the ski areas have snow-making down to a science. They should – they’ve been doing it for 60 years. Overlooking the area of Skytop Lodge and beyond from the Observatory. The Pocono Mountains is indeed a romantic place to visit. Besides your significant other, there are so many other things about it to fall in love with. With 2,400 square miles encompassing Pennsylvania’s Carbon, Monroe, Pike, and Wayne counties, the Pocono Mountains region is home to rolling mountain terrain, breathtakingly beautiful waterfalls, thriving woodlands and 170 miles of winding rivers. Winter offer guests the opportunity to ski, snowboard, snow tube and even snowshoe their way through snowy wonderlands encompassing over 185 ski trails, while summers also cater to the active traveler allowing exploration of 261 miles of hiking and biking trails, over 30 gold courses, whitewater rafting, boating, fishing and open access to nine state and two national parks. 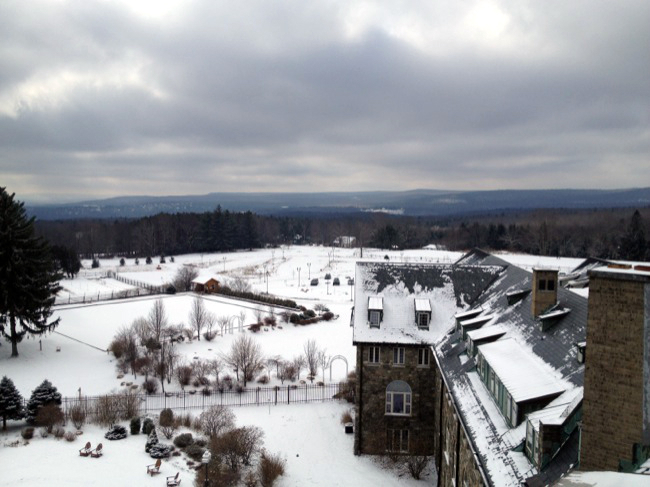 My stay at Skytop Lodge in the Pocono Mountains was courtesy of the Pocono Mountains Visitors Bureau. * Attribution: Photo courtesy of Boldly Go Solo -North America. LOL! Doesn’t it? I think I was like 7 when I first saw a commercial and remembered it.